After a morning walk and hugs and goodbyes to Diane & Steve, we headed to International Falls, Minnesota, only a couple of hours away and right on the Canadian border. Our destination: Voyageurs National Park. The ‘voyageurs’ were French-Canadian boatmen who plied the extensive waters of this area in large birch bark canoes trading manufactured goods for furs with the local indigenous people and transporting their bounty back to Montreal for export to Europe. We arrived early at the Rainy Lake Visitor’s Center and had a chance to check out the museum and walk some of the interpretive trails. Unlike many national parks, Voyageur is nearly 40% water and much of what there is to see and explore needs to be done by boat. I’d signed up for a morning group canoe trip led by one of the park rangers. The museum displays at Voyageurs were very illustrative. We met Eric the Ranger at the appointed time and place and headed to the canoes for some orientation, paddling instructions and safety precautions. We were advised to lock up our camera, phone and valuables … just in case. Eric mentioned that about once a season a canoe capsizes, but assured us that the odds were in our favor since it had already happened this season. We donned our life vests and launched the three canoes one at a time and tied them at the dock. I stood on the dock, then gingerly ... very carefully stepped into the bow of our Grumman 17’ aluminum canoe. David boarded at the stern. The canoe wobbled and rocked, but we settled into our places, distributed our weight and began paddling away from the dock. So far, so good. 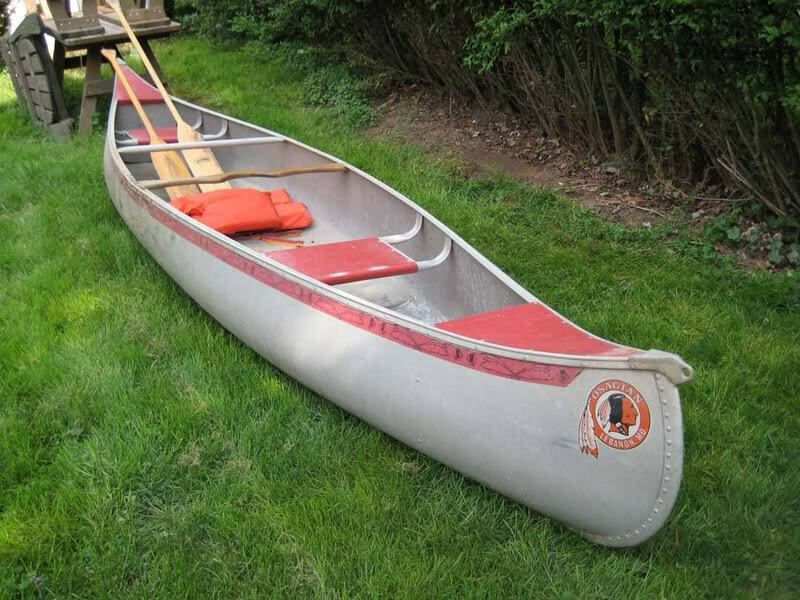 Grumman aluminum 17' canoe like the one we used at Voyageurs. It was apparent right from the git-go that paddling the canoe and steering are not our fortes. While the other two canoes headed to the ranger-designated meeting point, we glided smoothly in the opposite direction. In an effort to get back on course, we over-corrected and did a 360 and once again headed away from the group. We finally figured it out. Back on course, we caught up with the group long enough for a short ranger lecture on the area cattail invasion, then quickly drifted away. We obviously hadn’t quite mastered the finer points of canoe maneuvering. We turned around … again, attempting to rejoin the others. The canoe wobbled precariously, tipping from side to side to side and then … YIKES! We capsized! The total immersion into the cold Rainy Lake water was, to say the least, a surprise … and very invigorating. The canoe was upside down. I spotted David bobbing nearby. My paddle was floating a few feet away; my hat was slowly sinking; my glasses were still on my head. David’s hat and glasses were in place. I retrieved my paddle and hat and, as previously instructed, hung onto the canoe. We were able to right the canoe, but it was swamped. Now what? Funny the things you notice when you're bobbing around in the cold water and there's not much to do while you're waiting around and trying to figure your next move. A rather sizable spider that had been hiding in the bow had capsized with us and obviously could not swim. It tried getting back into the canoe … I batted it away. It tried again. No way I was getting back into that canoe knowing the spider was there, too. I smacked him with the paddle. David glanced at me with alarm. Ranger Eric had just noticed with some concern the fact that we were in the water and not in our assigned canoe. The group paddled over. The canoe was totally swamped. With a Herculean effort, Eric hauled our canoe on top of his canoe, drained the water, righted it and launched it on the other side. It was a pretty impressive. From our vantage point, wet, water-logged and at water level, reboarding without capsizing the canoe once again was improbable. We clung to Eric’s canoe with a hand on our canoe’s painter and swam to the rocky shore with our canoe in tow. The water was still deep and over our heads close to shore. We were beginning to shiver as we finally scrambled up out of the water onto the slimy, slippery rocks and took a quick breather before attempting to reboard. “In case anyone has never seen a leech, here’s one.” Eric the Ranger, ever the naturalist, pointed out to the other canoeists. I quickly surveyed my body, conjuring up images of Humphrey Bogart in “The African Queen”. Somewhat recovered, I climbed into the bow as carefully as possible, got settled and waited for David to board. The canoe wobbled a bit, tipped from side to side and then … you guessed it… glub, glub, glub ... we were back in the drink. Yup … we managed to capsize the canoe for the second time in the space of an hour. We have to give Eric and the rest of the group lots of credit for their patience. Eric calmly instructed us to turn the canoe upside down, and then haul it up on the rocks as it drained. Manhandling the canoe took some major effort as we grappled with the weight of the canoe while trying not to lose our footing on the slippery rocks. We righted it once again and then slid it down the rocks to launch it. With the canoe floating next to the shore, we once again attempted the boarding process. The group held its collective breath. The suspense was building. This time … success. “All set?”, Eric asked expectantly. “Yup … where to now?”, we asked. Really? The canoe trip was done already? Evidently so -and just as we were starting to get the hang of it. The other two canoes glided smoothly across the bay and around the point. We headed off in our own direction, managing to turn around at the last minute without capsizing, avoided some rocks near shore and then we gracefully slammed into the dock. Another safe landing. We disembarked without getting any wetter. Eric was exhausted as he bid us adieu, scratching his head as he wondered how we had managed a circumnavigation of the world, but couldn’t paddle 500 yards in a canoe across a duck pond without capsizing ... twice. As we squished and sloshed our way back to the Visitor’s Center, we laughed as we recounted our mishaps. Might as well laugh ... what else could we do? The ranger at the desk noted that some of the group looked like drowned rats. Samantha and Logan were fellow canoeist on our tour, and were much more accomplished at this canoe thing. Not only were they able to maneuver their canoe in the direction they wanted to go (and look good while doing it), they had mastered some of the finer points of canoeing - like staying in it. They had taken their camera with them and took the pictures above, thus saving these delightfully soggy moments in perpetuity. BTW, the park does not keep official records of such accomplishments, and since none of the rangers could remember anyone else topping our feat, we're claiming the record for most number of capsizes in a day at Voyageur National Park. And, given our obvious natural aptitude at canoeing, David has crossed a long canoe trip off his list of great adventures he's considering. Join us as we spend more time at Voyageur National Park and visit some of Minnesota’s really big guys.